The Linux kernel consists of several important parts: process management, memory management, hardware device drivers, filesystem drivers, network management, and various other bits and pieces. Figure 2-1 shows some of them. Probably the most important parts of the kernel (nothing else works without them) are memory management and process management. Memory management takes care of assigning memory areas and swap space areas to processes, parts of the kernel, and for the buffer cache. Process management creates processes, and implements multitasking by switching the active process on the processor. At the lowest level, the kernel contains a hardware device driver for each kind of hardware it supports. Since the world is full of different kinds of hardware, the number of hardware device drivers is large. There are often many otherwise similar pieces of hardware that differ in how they are controlled by software. The similarities make it possible to have general classes of drivers that support similar operations; each member of the class has the same interface to the rest of the kernel but differs in what it needs to do to implement them. For example, all disk drivers look alike to the rest of the kernel, i.e., they all have operations like `initialize the drive', `read sector N', and `write sector N'. Some software services provided by the kernel itself have similar properties, and can therefore be abstracted into classes. For example, the various network protocols have been abstracted into one programming interface, the BSD socket library. Another example is the virtual filesystem (VFS) layer that abstracts the filesystem operations away from their implementation. 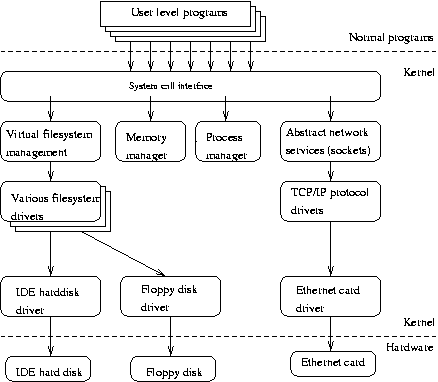 Each filesystem type provides an implementation of each filesystem operation. When some entity tries to use a filesystem, the request goes via the VFS, which routes the request to the proper filesystem driver. A more in-depth discussion of kernel internals can be found at http://www.tldp.org/LDP/lki/index.html. This document was written for the 2.4 kernel. When I find one for the 2.6 kernel, I will list it here.